It’s amazing how fast technology changes. 5 years ago my parents bought my husband and me a camcorder to take on our honeymoon. It was awesome at the time, you recorded to a mini tape. But, I quickly learned it was not easy to watch those mini tapes. I asked my husband to transfer them to DVD – but, uh, that still has not happened. Anyways, so after those mini tape camcorders came the camcorders that burned a DVD. Super convenient and you definitely skipped a step. My sister has one. But, I swear it seems like she is always formatting DVDs to be used and has limited space/memory. She never has the ability to whip out a camcorder and tape. Plus, it was still a bit “bulky”. Now, the Mom Buzz and my “partner sites” are buzzing about must-have summer items. This includes items that protect you from the sun, help you on your travels AND help build memories. 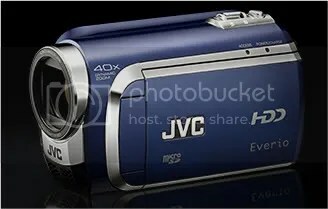 From pocket camcorders to digital cameras, and from self-published books to … the JVC Everio GZ-MG630 camcorder. 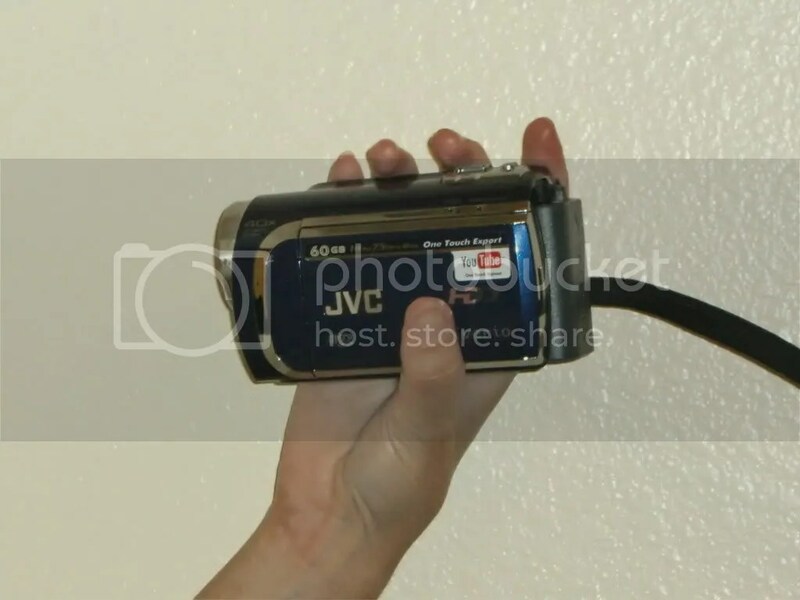 What is the JVC Everio GZ-MG630 camcorder? Well, if you want to capture hi-def videos of your family this summer, this is the go-to camcorder. First, I have to talk SIZE. It is SLIM. It’s unbelievable that such a small camcorder can take such GORGEOUS videos. It definitely weighs under a pound and it is about 4.5″ x 2″ x 2.5″ in size. When I was ready to take it out and play at SeaWorld, I realized I didn’t have a case for it. So I took an old film camera out of its case, and the Everio fit perfectly in. The length is smaller than my hand! It’s that petite! So much better than the camcorder my mom used to tape my graduation oh-so many years ago, which was about the size of a pug. Next, let’s talk tapeless. It’s tapeless and DVDless. It records straight onto its 60 GB built-in hard disk! There is an option to use a microSD, though. This is cool if you want to have more memory. Or, say, you are going to tape an event for someone, they could give you a microSD card to tape it on. But, currently I have not tried using a microSD card and have recorded directly onto the built-in hard disk. Now, being tapeless allows the Everio to be more slim than other camcorders. Plus, it is very easy to save your recordings onto your computer or upload to YouTube. Other options are to save your recordings direct to DVD and to a VCR/DVD Recorder. The camcorder is also easy-to-use…thank goodness! I mean, I am a mom-on-the-go! I do read directions, but I didn’t have the directions memorized when I brought the Everio to Sea World. I just had to keep my fingers crossed that it was user-friendly. I definitely learned a few things at the theme park, like you shouldn’t use the light to tape a whale behind glass no matter how dark it is – because then you just see the light’s reflection! But, going from light on to light off, or going back to review videos and see I somehow taped someone’s legs was easy thanks to the sensor on the left side of the LCD monitor. You choose the Menu button. Then you just slide your finger up and down to see the different options. When you see an option you like, you touch the set sensor. Simple! Now, this camcorder is all about capturing memories – like the ones you will be creating this summer. But it is capable of capturing these memories on four video quality modes. We shot our SeaWorld videos on Ultra Fine. Other options include Fine, Normal and Economy. With each video quality choice, you will have a different length of recording time. With the Ultra Fine choice I had 14 hours and 20 minutes of recording time – more than enough for a SeaWorld day trip! Auto Power ON/Off – No wasting batteries when not in use. Auto Lens Cover – This camcorder is so mom-friendly! It knows that a loose lens cover would end up in a toddler’s grasp, so it covers its own lens when not in use. There is so much to talk about with this camcorder.The Everio GZ-MG 630 retails for $429.95. It is a gorgeous, slim camera that I absolutely love. It would make a wonderful Father’s Day gift, Mother’s Day gift, Anniversary Gift, Wedding Gift, Graduation Gift… get the picture? There are so many memories to capture, that I think the recipient would absolutely love it! Plus, you can even gift it to yourself! Buzzworthy: Need help with your new JVC Everio – check out JVC’s Everio tutorials on YouTube!